EXCLUSIVE: WWE ‘RAW 25th Anniversary’ DVD Scheduled – Documentary, Full Episode or Box Set? In September we reported that one way WWE is planning to celebrate the 25th Anniversary of RAW will be with a new DVD. A month later came the announcement that the live anniversary episode will fall on Monday, January 22nd, broadcast from TWO separate locations in New York City. 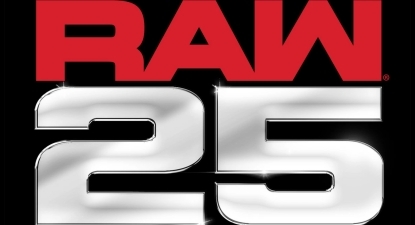 Today, WrestlingDVDNetwork.com can exclusively reveal that the “RAW 25th Anniversary” DVD has just been officially scheduled for release in the United States – and we’ve got our hands on the first TWO synopses for it and most importantly, the release date! And now, this DVD set shares the most amazing and unforgettable matches & moments in RAW’s history, spanning from 1993 to 2017, featuring an all-star list of superstars from Bret Hart and Shawn Michaels, to Stone Cold and The Rock, to Triple H and John Cena, to Roman Reigns and Brock Lesnar. WWE’s flagship show has always been the place where history is made, and you can relive it all right here in one place! The “RAW 25th Anniversary” DVD will hit stores beginning April 3rd, 2018. So, will it contain a documentary, a match compilation, the special live episode, or will it be another big box set? 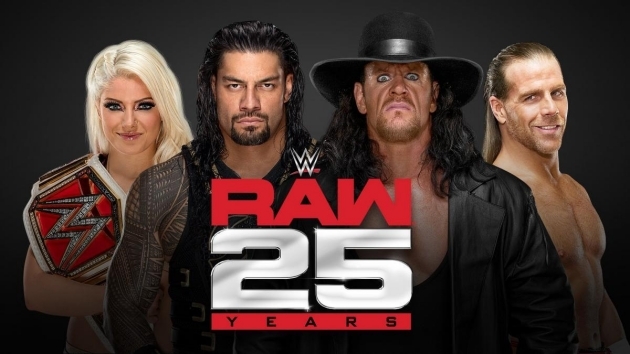 As of now the company will be formatting this one as a presentation of both the 25th Anniversary episode from January and a compilation of RAW’s biggest matches and moments. Expect to see a 3-disc DVD collection that houses the full RAW 25th Anniversary episode (likely on the first disc) and the remainder of the set a look back on milestone moments in Monday Night RAW’s unprecedented 25-year history, as confirmed by the second synopsis below. Pre-order opportunities are due to go live in the coming weeks. And now this DVD set shares the 25th Anniversary episode in its entirety and the most amazing and unforgettable matches and moments in RAW’s history spanning from 1993-2017. Heads up — TLC: Tables, Ladders & Chairs 2017 has landed on DVD this week! You can get hold of your copy of the new PPV DVD for only $9.19 here on Amazon.com, or if you’re in the UK pre-order it for £12.99 here on Amazon.co.uk. Thanks goes to WDN reader Jordan Deleo for sharing the photos below. The pics reveal that a free Sasha Banks trading card from the Topps “Superstars” series is found inside the packaging. – United States: AVAILABLE NOW! 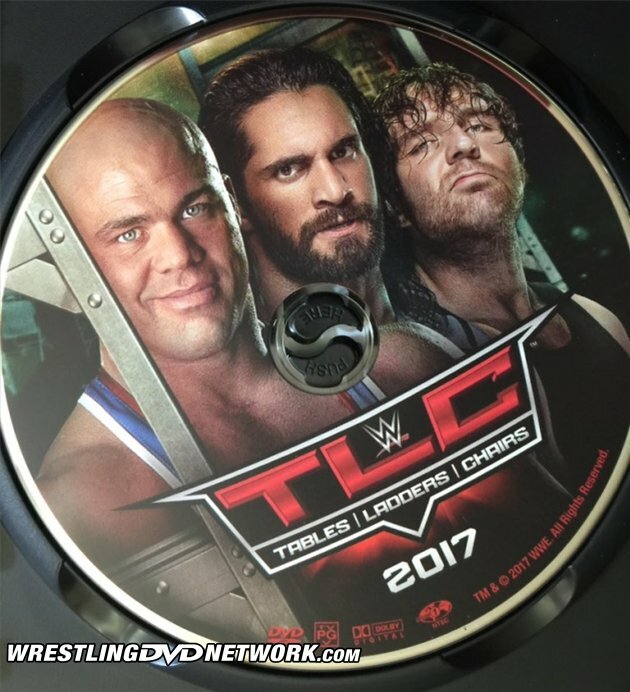 Grab the TLC 2017 DVD right now here on Amazon.com. – UK/Europe: December 11th. 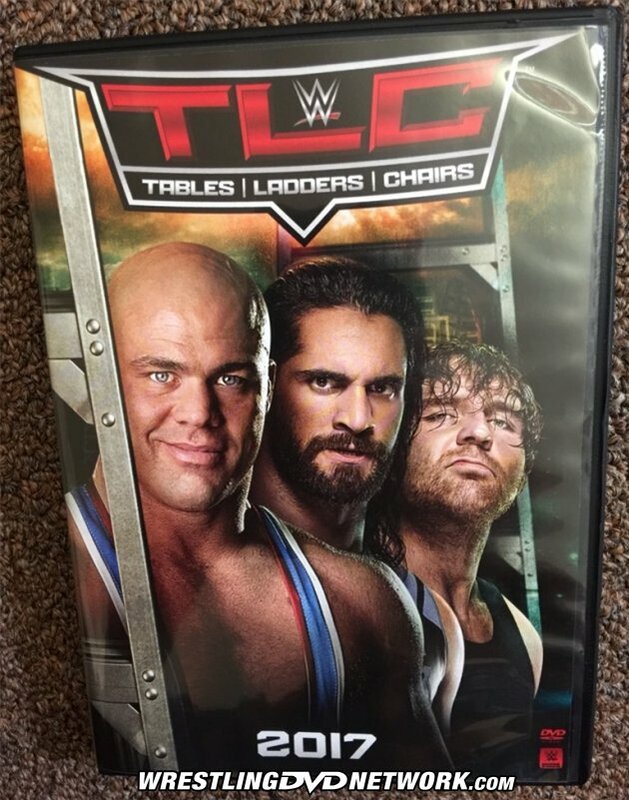 Pre-order a copy of the TLC 2017 DVD on Amazon.co.uk. I wonder if they go ever release the best of WCW Saturday Night? Or release the best of WWE Superstars? As great a set as that was, it sold very poorly, so the idea got nixed. Shame though as I’m sure the 97-2002 years would’ve sold better. They probably just knew that a 95/96 set would sell even worse and didn’t want to risk it. I just so happened to read something yesterday from a former Silver/Clear Vision employee who said that the seasons 1 & 2 DVD sold really well, at least in the UK. Maybe not so much in the states then. Will this be released in the UK? If not, how come? Hope they include the Austin beer truck segment. I’ve been trying to get my hands on that footage for years. Haha, yeah – that does seem to be the case. If you look at the comments recently, there’s no rhyme or reason for why one comment gets a thumbs down and another one gets a thumbs up. Someone can say they like a DVD that’s coming out and they’ll get a thumbs down, another person can say they hate everything and get a thumbs up. If we can see which usernames are doing the voting then people wouldn’t be so quick to vote negatively. And with that I’m sure I will get thumbs down for this post. I honestly couldn’t care less is my comments get a “thumbs down”. Why should that affect my life in any way? Lol. I hadn’t even noticed the feature until it was mentioned on this thread to be honest. What this board does badly need though is an “edit comment” feature. I’ve lost count of the amount of times I’ve submitted a comment only to immediately notice a spelling mistake afterwards, lol. The thumbs up/down was implemented on this site many years ago and then unexpectedly disappeared faster than Kofi Kingston’s Jamaican accent. I am hoping the bed pan incident will be on with the debut with Mr. Socko. Been looking for that footage for YEARS! Yeah, and DX mocks the Nation – that’s another rare gem! I’ll likely buy this for the 25th anniversary show (I’m really looking forward to the Manhattan Center portion), but am highly sceptical about the rest. I assume that we’ll get another rehash of Razor Ramon vs. The 1-2-3 Kid, Shawn Michaels vs. Marty Jannetty, and everything else on the company’s ‘approved matches’ list. I’ll be greatly amused to see what they think is worth including from 2012 to 2017, though. I literally cannot believe the current plan is basically a re-hash of Raw 100. There’s no way I’m buying something in that exact same format again just for the new episode of Raw. This should be a 25 episode compilation set. There are so many good episodes they could release on dvd. Yes I’m aware the network has everything but this would still be nice to have. WWE is in a huge DVD slump IMO. Nothing really worth buying. Too much new stuff is all they release. No good docs or legend sets lately. I will probably buy it. Do I need to buy it to see the content? No, I have the WWE Network. However, I will probably buy it anyway. If this thing is not formatted properly. If they take the old episodes of Raw and stretch them into wide screen, like they have done on a few other recent DVDs, I will not buy it. I really want it on blu ray. Very much doubt it. If it was some kind of Anthology set, then maybe. But they can pick and choose what they include here, and picking a Benoit match will look like condoning. Not saying I don’t wish it were different sometimes; but that’s the reality. Thats true. Don’t see it being released on any set and only available on the Network. I remember reading Jericho really pushed for the match on his first DVD in 2010 but was refused. personally I just can’t see how this could have much great content that wasn’t already released before. I mean, besides the “15th Anniversary” set, which has also covered the best matches and moments up until that point we also had the “Raw 100” release, the 1993/1994 set, “The Attitude Era” (so the highlights of that timeframe have also been done) etc. It’s probably considered more of an updated version of the 15th anniversary set for people who don’t have that. Like the updated 21-1 streak DVD after the 20-0 one. Before the WWE Network, I would be all for this. But knowing every Raw is on the WWE Network for me to watch whenever I want?? No thanks. The reason why the Raw 20th box set sold so well years ago, was because there was no WWE Network at the time. So to get the Raw shows we got on that box set was pretty awesome. But now it’s already at our fingertips. Lol, well you could say this 99% of the time. But this page is for DVD collectors. Completely agree with your points as I too have The Network. However since not all the RAWs on The Network have off air stuff, they should have the entire 25th Anniversary RAW w/off air footage if it’s worth including and as for the rest of the set’s content? The best off air stuff that has not yet been released. Thoughts if any?? I really want to like this but it’s going to be tough to have anything original on this. Hopefully they dig deep into the archives to show something worthwhile. This release sounds at lot like the Top 100 Raw Moments. I bet most of the content will be the same. I would have preferred if they did a 3 disc set featuring unreleased Raw matches. If I am not mistaken, Smackdown will have its 1000th episode in 2018. I wonder if we will get a DVD/blu-ray to celebrate that? I’d like that. didn’t they (kind of) do that with the “Best of Raw After The Show” release as well? Yes. I was hoping for a release featuring matches from Raw that haven’t been released on DVD before. I’m sure there are still some gems out there. I would argue that there are probably really not that many left that haven’t been released before. Yeah, they did kind of exhaust the most interesting Raw stuff on that set to be fair, and even that felt like a bit of a chore to sit through, as most stuff without commentary tends to. Raw After The Show included never before seen dark matches. I believe Mark is talking about televised matches from Raw that have never been released on home video before, of which there are plenty. I hope they get it right. Lame…..let me make sure I delete the show in HD off my DVR so I can buy it in garbage DVD format. Lol. Phewl. But then the photo of you holding your silly belt like a child gives that away.